FARMINGTON - If you’re looking to refresh your palette with savory flavors, look no further than Cugino’s Restaurant of Farmington. Using fresh ingredients and a keen eye, owner and chef, Mario Cirikovic, makes sure every plate presented is perfect. A dish he prepared that surprised me was the stuffed salmon. This “Catch of the Day” special was something special. A fresh, flush pink salmon, stuffed with lobster and crab meat, served over sweet mashed potatoes was a combination I wasn’t expecting. The sweet potatoes compliments the salmon in an incredible harmony without overwhelming the salty and creamy texture of the stuffed meat. Sanela Korkutovic, the daytime manager at Cugino’s, informed me that one of the most popular items on the menu was the Seafood Medley. After experiencing it for myself, I can understand why. Entangled in a buttery angel hair pasta, is fluffy scallops, lobster, shrimp and chopped clams that melts in your mouth. The plate is then drizzled with olive oil, flaked with dashes of garlic and mixed together with a creamy San Marzano tomato sauce. With a dish consisting of several seafood items and sauces, Chef Mario created an outstanding meal that balances just the right amount of salt and spice. If you’re a true red meat lover, I highly recommend the bone-in Short ribs. 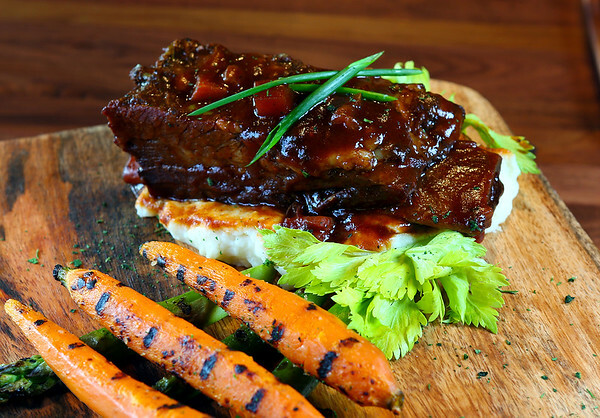 Served on an engraved wooden board, this thick rib was served over mashed potatoes and a side of grilled carrots. Cutting into the rib was easy and smooth, and the meat slid off the bone. For 17 years, Cugino’s has been serving delicious meals to its customers. With friendly service and over 150 different types of wine, it’s easy to relax and enjoy a hearty and fresh meal. For more information about their menu, private events and other specials, visit their website at www.cuginosrestaurantfarmington.com/ . Posted in The Bristol Press, Arts, General News on Tuesday, 15 January 2019 18:32. Updated: Tuesday, 15 January 2019 18:34.